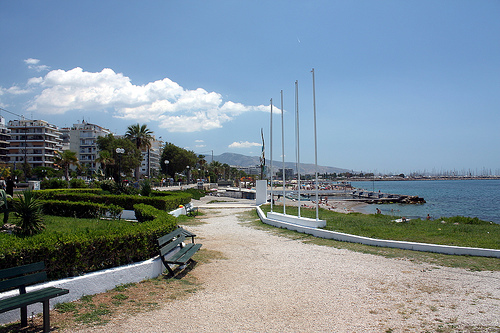 Palaio Faliro is another beautiful coastal area crossed by Poseidonos street. Its greatest advantage is that it is so close to the sea that most of the houses heading towards the sea have an incredible view. There are dozens of beautiful cafes by the sea and several buses pass by there along with the tram leading either to Piraeus or Glyfada and Athens. If you start walking towards Piraeus you will see a sign leading to the marina of Flisvos, a very nice location by the sea which was recently reformed. There, you will find various cafes, restaurants, shops, banks and a bakery, yachts by the pier and sailing clubs. Further down you will notice the big Battleship G. Averof that operates as a museum. This ship has participated in different wars while it joined the Greek fleet in 1908. Its capacity is 670 crew members in peace time and 1200 crew members in war period.